The display on the 570S TFT is very clear and very bright. The LCD panel used in the 570S TFT has a contrast ratio of 250:1. What this value applies to is how dark darks are and how light bright colours are. Essentially the higher the contrast, the better the image which can be produced by the screen. Typically contrast ratio sit in the range of 200:1 to 300:1, although some very high end panels can go as high as 400:1 or even 500:1. Panels of that level are generally used in very high end TFT-based TV's or medical applications (like an X-ray screen). In our testing, anything above 100:1 is entirely suitable. Brightness or Luminance comes in at approximately 200cd/m². For comparisons sake, typical TFT displays have a luminance ranging from 180cd/m² to 250cd/m². The 570S TFT sits squarely in the middle and provides a very bright picture. 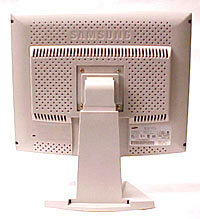 To bring that number into terms, it is about as bright, if not slightly more than the average CRT display. Dot pitch sit in at 0.297mm and the viewable angles are 60 degrees left, 60 degrees right, 55 degrees up, and 55 degrees down. Those values are commonly written out in this manner on the specs; 60/60/55/55 (L/R/U/D). What they refer to is at what viewing angle the picture starts to degrade. For example, some bank machines have very shallow viewing angles so that you can really only read what is on the terminal display by standing directly in front of the display. In the case of TFT displays the idea is the same, but reversed. About the best set of viewing angles you could hop to see would be 80/80/80/80, the poorest could be on the order of 15/35/45/45 (a notebook's TFT display). Resolutions are always a tricky thing with LCD displays. Generally you always want to run them at the suggested resolution. That means if a display is ideally set to 1024x768, you really want to head that advice. Changing the resolution to another setting, perhaps to make the characters on the screen "bigger" will result in the loss of some sharpness in the images. This is most pronounced when reading text. We took a few pictures to illustrated the degree of fuzziness that happens when the display resolution is lowered. The first image demonstrates what the screen would display with a resolution of 1024x768. Keep in mind the pixelation and colouring you see is because we have the lens of our digital still camera about 2mm away from the surface of the display (the Sony Mavica MVC-FD73 uses camcorder optics and can focus on objects that close).